You advanced our of your group as first and in to the semi finals. I practiced really hard. I lost a lot during my practices so I was worried but I am so relieved that I was able to advance out of my group as first. What place did you expect to get after seeing your group? Before I started practicing for these matches I expected to get first place. I practiced a ton after the team leagues were over but I lost a lot. Which resulted in me losing confidence within myself. Thankfully my games went well today. Any match that you specifically remember from today? My match against Life is the match I remember the most. I worked really hard to pull off a comeback on Entombed Valley. I thought I won during the middle of the game so I dropped my guard and that is why I lost. It was really disappointing. You will face the winner of PartinG and viOLet for the semi finals. Who do you want to face? My ZvP and ZvZs are both similar but none the less I would like for PartinG to advance. 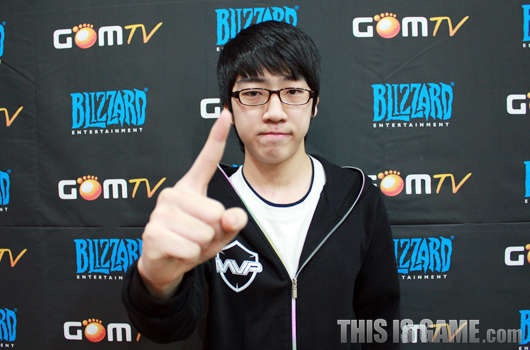 I think I should try to create a ZvZ finals by taking down the Protoss. After losing your very first match, you then went on to win every single match afterwards. What was your secret? After I won the GSL championship, I was sent out for the GSTL as captain but I ended up failing. I was brimming with confidence but after I lost my opinions changed. I think I was being way too overconfident after my championship victory. I've also heard people say that I only won because I am a Zerg player and that they still refuse to acknowledge me. That is why I was motivated to work even harder. What do you think are your chances of winning this tournament as well? It doesn't matter if a player is known for being good at ZvZs because in the end it's all the same. The better player is the player who wins. One battle determines the victor. I want to thank the coach for coming with me all the way to the studio. I want to thank my family and relatives for cheering a lot for me. I believe that I still am not being acknowledged as a player so I am going to work even harder so that people will acknowledge me one day. Lastly, I want to thank our sponsors Lotte Chilsung, RAZER, GOMtv, and partners MYM and Wayi Spider. Tell us how you feel about advancing to the Ro6 playoffs. I thought I would advance out of my group as first but I wasn't able to so it was disappointing. But I still made it non the less so I am happy. I remember the Cloud Kingdom game against viOLet very well. That was a game where I thought that I could win but ended up losing. I had over 10,000 minerals at the end of that game, which shows you just how badly I messed up (laughs). 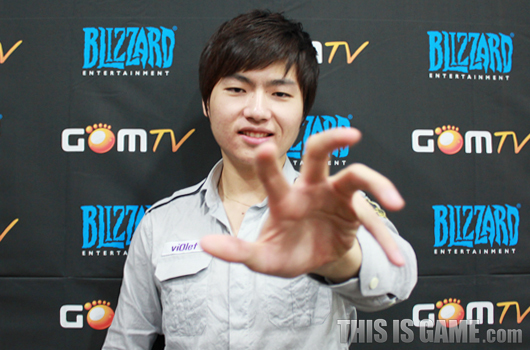 You will face DRG in the playoffs. I think he'll be able to beat me even if he doesn't practice (laughs). I sure hope that this flattery will trick him. Regarding the final game, you showed us that you were laughing after you lost game two and then went for a 6 pool for game three. Why was this so? I ended up losing a game that I had thought I won for game two so laughter just ended up breaking out. I figured I would lose game three even if I did opt for a macro game so I decided to just put all my cards on the table. I felt like I would win even if my 6 pool got blocked. What do you think are your chances of winning the championship? As long as luck is on my side and I don't make any mistakes, I think I am fully capable of winning the championship. If PartinG cannot make it past the Ro6 then the semi finals will consist of nothing but Zergs. Are you confident even then? If I lose just once then I start to lose my mind. If I can just fix that then I should be able to win with no problem. First off, I want to apologize to the coach. I hope he punishes me less when we get back to the team house. I am very sorry for what I did. Lastly, I want to thank our sponsors Red Bull, ZOWIE, and Joy Gear. Thanks to the results of the final match, you advanced to the playoffs Ro6. Until now, my results for Korean leagues have been terrible. I looked at my GSL win ratio and I saw that I was at 30%. So I was really worried. Thankfully Life was able to give me a great present. I think thanks to this, I'll be in a good mood for tomorrow's match. You will face advantageous PartinG in the playoffs Ro6. I had a lot of fun watching PartinG's games yesterday. I'm sure the games against him tomorrow will also be fun (laughs). A lot of people say that his immortal all ins are full of soul but to me I don't see it that way. I feel comfortable when facing PartinG so I'm sure I'll be able to use that and crush his ki. Even though you say that, your opponent is PartinG who used said all in strategies to win two tournaments. Do you have an answer for his ways? These days all Zergs can block immortal all ins really well. Even in my match against Rain I thought to myself that I blocked it really well, but as it turns out all my units had died. After my loss, I thought it through carefully and I realized that as long as I don't lose my focus, I should be able to win. This was your first match in Korea in a while? How did you feel? I'm not sure if it's because I've gotten so used to playing in foreign tournaments or what but I feel like I've been invited to play in Korea now. Any match that you specifically remember? It's without a doubt the 6 pool game between Life and Seed (laughs). I think it has been a while since I watched a match while holding my hands together. Personally, the match that that made me the most happy was the game against Life on Cloud Kingdom and the match that made me disappointed was the game against Seed where I made a foolish mistake. If you can take down PartinG, the semi finals will consist of nothing but Zergs. Personally, I am comfortable with ZvZs. I lost to Sniper today but I know well what I did wrong. If I end up meeting him again in the semis I am sure that I would win this time around. As long as I can bring down PartinG, I think I am fully capable of winning the championship. 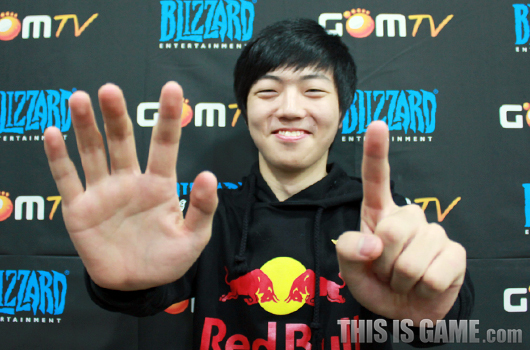 I have gained a lot of confidence ever since the IPL finals against Leenock. I prefer to play ZvZs on a regular basis anyways so I am confident. I just hope that I don't grab second place this time. Recently, there was good news that AZUBU had expanded its SC2 roster. I am so happy now that I have teammates I can communicate with. Currently I only have about 2 - 3 players that I am really close with but I really hope that we can all get to know each other quickly so that we can help each other out and make good results as a team. I plan on getting a ton of help while I'm in Korea and then plan to repay the favor by helping them when they enter foreign tournaments. I hope that the fans will have a lot of expectations for us and eagerly anticipate our performances. I want to thank coach Lim for coming to the studio with me. I want to thank coach Choi of team MVP for giving me a ride to the studio, coach Lim from AZUBU for sticking with me throughout the entire day, eSports manager Mr.Kim, and our sponsors AZUBU and RAZER. I want to ask that the fans cheer hard for AZUBU from here on out. My friends from America cheered on a lot for me. I want to thank those friend and the fans. Thanks for the interviews as usual. Lol that Life picture, too good. Thanks for the hard work, Seeker! Sniper's really stepping it up lately! What did Life do (as in why is he getting punished)? Not the best picture for Violet (since he's so handsome), but great interviews and great translations! Yeah, I'm really wondering myself! Does anybody know? SeeKeR needs to get a Nestea award for being an S-class interview translator for so long. I think its because he accidentally paused or something against seed. Ahhhhhhhhhhhhhhhh nooooooo Seeeeeeeed T.T. I so thought he would make it out of this group. Now that my two favorites are out, I'm gonna be rooting for Violet. His photo is pretty awesome, he's been a strong player all year, and even though he is no foreigner it would be nice to see someone who practices in North America succeed in the GSL. But if I'm being realistic...Sniper, Life, DRG and the rest seem almost insurmountable for Violet. I really hope he wins but I just don't know if he can take it. A man does what he must — in spite of personal consequences, in spite of obstacles and dangers, and pressures — and that is the basis of all human morality. Life stop getting in trouble.